Mary Ellen Friends began teaching at Deerfield in the fall of 1995. She graduated from Brown University with a BA in East Asian Studies in 1987, studied for two years in Taiwan at Tunghai University and through the Stanford Center Interuniversity Program, and then earned an MA and an MPhil at Yale University in East Asian Languages and Literatures. 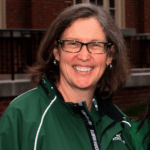 Mary Ellen teaches in the history department, she coaches field hockey, and she runs the recreational ski and snowboarding program. Kimberly Wright and the Deerfield field hockey program have proven to be a perfect fit. Now home to one of the premier teams in New England, Deerfield has become a force to be reckoned with since it turned to coeducation in 1989. In that time, the field hockey team has qualified for post-season play in every year but one. They have six Western New England titles and won the New England tournament in 1992. Under Kim's leadership, the team has amassed an impressive 83-33-12 record. Before joining Deerfield’s ranks, Kim held an assistant coaching position at Georgetown. She was a member of the University of Massachusetts – Amherst field hockey team, which reached the NCAA Division I tournament in each of her four years and competed in the finals Kim's freshman year.